David shared a photo on Facebook. It immediately grabbed my attention. If no 3 year-old is available, hand the phone to an adult who speaks another language. Irish works well, especially when staying in France! I know because I proved it while staying with Elly’s French mother, in France some years ago. She has three mothers. Some people collect stamps, my Elly collects mothers! Lonnnnng story…. We were enjoying an aperitif when the phone rang and our hostess went to answer it. 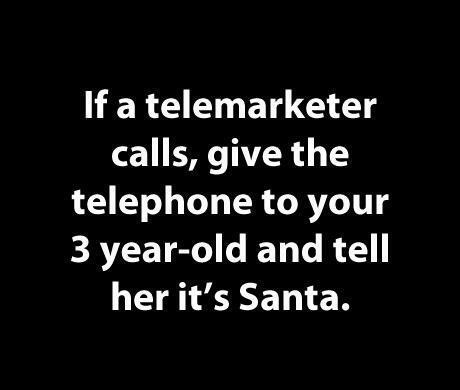 Eventually she returned with phone in hand and motioned to Elly that it was a telemarketing call and no matter what she said in French the caller would not give up. Now my ‘Irish’ is not the best, but I figured the caller would not notice. I began muttering away in a rather stern voice. I talked the greatest load of rubbish and when I ran out of sentences, I began all over again. Elly was splitting her sides laughing at me by then. Bingo! The caller hesitated long enough to ask, in English, what language I was speaking. “Is it Turkish” was his first suggestion, but I never pretended that I understood and kept on with my prattle. I was beginning to enjoy myself but finding it hard not to laugh. Eventually he grew tired, gave in and hung up. At home on occasions I have set the phone on the counter beside the radio and turned up the volume. Having done that I would go and do a chore at the other end of the house. The caller was paying for the call and not me, so keeping the line open prevented them using the line to annoy someone else. Nowadays, my number is unlisted in public directories, so I manage to avoid the sales calls. I do from time to time get a wrong number where somebody has miss dialled. “I’ll go and take a look.” I said noisily setting the phone down. The line went dead and I was never troubled by that man again! This entry was posted in Alphabet, memories on September 5, 2012 by Grannymar.